I am passionate about making yoga available to everyone, and I believe that whether you are a serious athlete or a “groovy granny”, whether you have limited mobility or superhuman strength - the beauty of yoga is that it is a personal journey. So, what you can't do… is irrelevant. Everyone can become stronger, more flexible and enjoy more balance in their lives. I have been practicing yoga since 1988 and I have a lifelong interest in the practice of meditation. 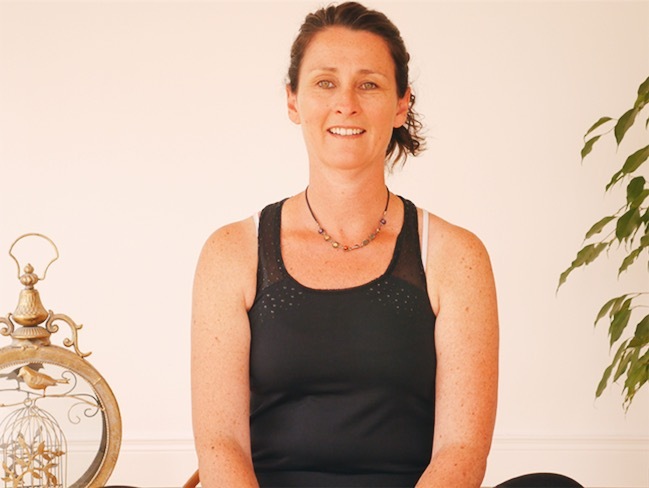 I trained with Yoga Therapy Ireland, initially as a yoga teacher and later as a yoga therapist. To my husband’s dismay, I am continuing my lifelong journey of further learning. I was one of the first teachers in Ireland trained in Yin yoga, and recently qualified from the first iRest® teacher training in Ireland. Why not come and visit my studio where everyone is welcome; take time out for yourself to relax and regenerate your mind and body. BA (Hons) Psychology, MSc, BSc. I came to Yoga after the birth of my second child. Finding life extremely hectic and busy I needed something to re-ignite my energy yet calm the mind. Yoga was my chosen path, and I trained for many happy years with Paula Mitten. I can truly say that yoga has given me a whole new perspective on life and on the world. My practice has helped me grow stronger and more flexible. Every day, yoga inspires me to live life more mindfully. I completed my teacher training with Yoga Therapy Ireland. My teaching style is calming, non judgemental, bringing a spirit of playfulness and joy while also providing a space for the student to quietly connect to the their true authentic self. Students taking my classes will feel more energised, stronger feeling the hidden capability within them really shine. My students have told me that my classes improved their sleep quality immensely, their digestion improved, couples attributed their ability to conceive a baby on my flow class and those with a hectic busy life felt calmer. You may be a person with arthritis, a triathlete, a new mum wishing to tone up, a marathon runner, or a person with restricted movement… I am the teacher for you. I am a Yoga Therapy Ireland (YTI) trained teacher. I have over 15 years' experience of doing yoga. I began teaching yoga to children and then trained as a Hatha Yoga teacher in 2015. Since then, I have gone on to train in pregnancy yoga, mother-and-baby yoga, and yoga therapy. I love pregnancy yoga, I love getting to know the mothers-to-be and following them on their journey to birth. I have been a yoga practitioner since 1996. Since then, I have explored different yoga traditions: Ashtanga, Kundalini & Hatha and I have found inspiration, food for thought and opportunities to look at life differently … especially when your head is upside down or your limbs are entwined every which way possible. My personal motivation when I step onto my mat is to feel good, and to connect in a thoughtful & soulful way. This is what I wish to transmit as a teacher. There is an opportunity for students to grow, making of their yoga practice a time to become more joyful and peaceful beings. I have found teaching yoga very gratifying and fulfilling, I love to see students taking their own steps towards understanding, transformation and growth. Hi, I am Mary, and I love sharing yoga with everyone, Yoga is for Everyone. When I started doing Yoga I was afraid (because I'm no spring Chicken). I thought you had to be so flexible, so fit, so young, etc., and felt I would never be able for it.